It all started when I opened an Instagram account back in early 2017 to showcase the renovation we had done on our 1875 Toronto victorian bungalow. I'm a total sucker for old houses and all the charm they encompass, but I had no idea what lay ahead. Enthralled by the amazing response to our house renovation, press inquires, photoshoots (Apartment Therapy, HGTV Canada, Chatelaine...), and soaring followers I knew that Tiny House Mama could be something more than just an Instagram account. After years of co-owning a popular hair salon in Leslieville, I began to envision myself creating a more small scaled personalized shopping and hair experience, one that encompassed all my passions under one roof. When I discovered the single story little flower painted building on Gerrard St East’s rapidly gentrifying strip, I knew it was a sign and Tiny House Mama Beauty + Goods needed to become a reality. From years as an entrepreneur, and believing in the good fortune that my Tiny House Mama Instagram had showed me, as well channeling some much needed chutzpa (yiddish term for guts, nerve, boldness, and maybe a little audacity), it allowed me to take the plunge I needed to bring this new chapter to life. 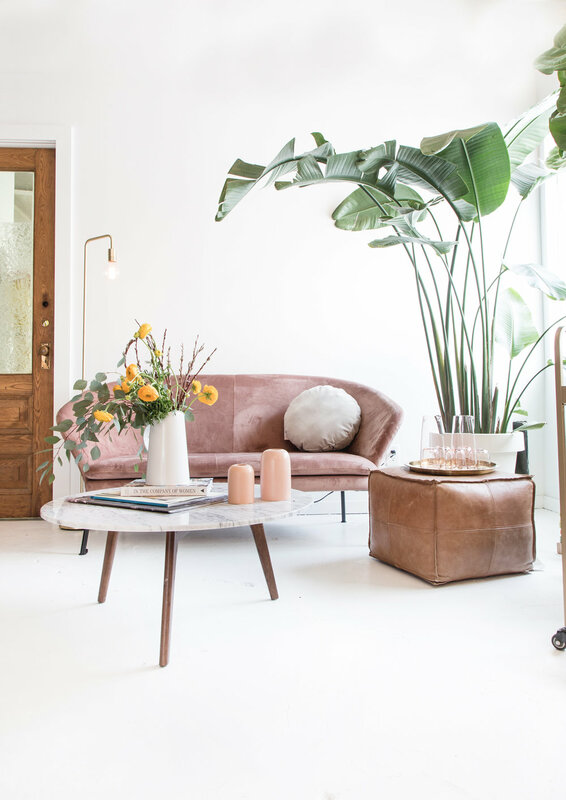 A small flowered building set in the middle of Torontos east Chinatown belongs to a collaborative space that houses both Heri Furniture, who has both a showroom and workshop in the back and the curated stylings of Tinyhousemama Beauty + Goods. The front shop is a collection of Stacey Lipstein's passions brought to life, beautifully bespoke hand crafted pieces by Heri Furniture (his famous stitched stools and benches), a collection of Vintage Moroccan rugs, cute round pillows made locally, Gorgeous paper goods to fit every occasion, millennial pink ceramics made in Montreal. As well as beauty goods locally foraged and produced. And of course the simple turquoise hair chair that services clients during operating hours. This place truly is a collaborative space bringing all passions to life at Tinyhousemama Design+Beauty outpost in Torontos East End. As stylist, Stacey never found herself bound by rules or what is on trend. She's always loved to blur the lines between modern, classic, farmhouse and boho. A huge believer in filling your space with things you love, she is drawn to pieces that are something that would just "work". This makes a space continue representing you and your life over time as oppose to just following fashion. I'm kind of a mix bag and hard to really pinpoint under one heading. If I had to narrow it down I tend to love coffee, small luxurious indulgences, local artisans, wandering new cities, spending time near the water and I'm a total sucker for french fries, but then again, aren’t we all. I am a visual creator who has been continuously drawn to the art of design; beautiful things, people and places. My work and life experiences have taken me across a wide spectrum, from completing my degree in Women’s Studies to working in the fashion industry and taking on the merchandising world. That opened me up to the world of furniture and design, and gave me the opportunity to manage a well known furniture business here in Toronto. I also have an adorable 3 year old which has made life exhausting, challenging and a million times better, a loving partner and a doodle that has the eyes of a human…no seriously it is a little creepy sometimes. I have lived in Leslieville, and South Riverdale for over a decade and love that I have been fortunate enough to see this area grow and have been a part of that change and continue to be. Pretty much everything else you need to know about me you will see in my four walls.